The handwriting policy is intended to enable all children in the school to develop a fluent, legible and presentable script that will assist their writing by the end of YEAR 2. The principal aim is that handwriting becomes an automatic process, which frees pupils to focus on the content of the writing. In order for this to occur, handwriting is taught in ways that enhance fluency and legibility. In the Primary Years handwriting will be taught and then practised at least twice a week, preferably more often. Correctly formed handwriting will be targeted in all curriculum areas. Pre-writing skills will be introduced and reinforced in Kindergarten classes. Handwriting is a skill which affects written communication across the curriculum. A written policy which satisfies the requirements of the National Curriculum Framework (2011) and which is agreed upon and put into practice by all staff, will help to ensure consistent teaching and the development of legible and fluent writing throughout the school. Research shows that even in this age of computer technology and an emphasis on keyboard skills, handwriting remains an essential skill for everyone. The competent teaching of early skills will be consistent across the school. Handwriting is a movement skill which needs to be taught explicitly. Correct modelling of the agreed style by the teacher is very important. 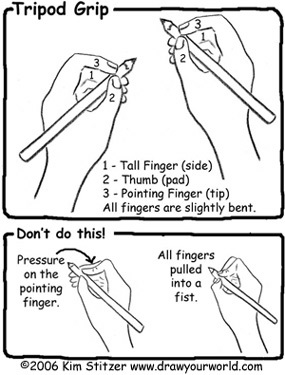 Children need to practise handwriting movements correctly and often. The first handwriting lessons are vital to ensure that the children we teach, learn to form the letters of the alphabet with the correct sequence of strokes. Purposeful guided practice will lead the child throughout the process. The correct formation of all letters needs to become quite automatic and may require a lot of practice, concentration on developing accuracy and fluency. The order in which letters could be taught is being left to the discretion of the teacher . Emphasis should however be given to repeated instructions. Consistency in the attitudes displayed, the methods employed and the models provided are the key to effective learning. 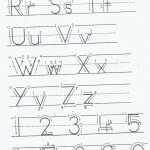 Once children are able to form letters correctly, line guides should be provided when children are writing. 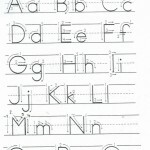 This will help develop uniformity of size and the correct position of the letters. Wide or narrow lines are used according to the child’s needs and at the teacher’s discretion. Teaching includes presentational features such as margins, dates, underlined headings and how to cross out with one straight line ( the use of rubbers is discouraged). Pupils are given the opportunity to experiment with a range of writing materials and implements; a multi-sensory approach is used to help pupils feel the movements in the land. Gross motor skills are developed through sky writing letters, making patterns in the air and making different body shapes and actions. Fine motor skills are developed through activities such as bead threading, play dough modelling and finger painting. Pencil control is developed through activities as tracing and pattern copying. Zigzag letters: letters: v,w,x,z;numbers:4, 7. Pupils in Years 1 and 2 develop a legible style. This is achieved by developing a comfortable and efficient pencil grip and by practising handwriting in conjunction with spelling and independent writing. Correct letter orientation, formation and proportion is taught. The vast majority of children are able to write legibly and fluently. However, since some pupils need more support, provision will be made for this in Individual Education Plans. Teachers of children whose handwriting is limited by problems related to fine motor skills should liase with the LSA to develop a programme designed for the individual child. This may involve extra handwriting sessions and access to extra resources. 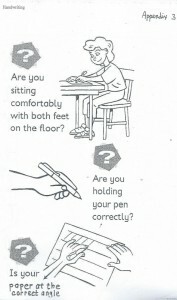 As previously mentioned, there are other areas that could be considered such as posture, lighting and angle of table.